CBD oil is an excellent means of promoting animal health and well-being. Like humans, mammals also have an endocannabinoid system. This endogenous system functions as a signal generator and controls all important physiological and biological processes. Cannabidiol (CBD) plays an important role in the functioning of the endocannabinoid system, as CBD stimulates the receptors. Therefore, CBD oil can help restore balance and maintain physical and mental health of the animal. Optima CBD oil is widely used in dogs and cats for its relaxing and anti-inflammatory properties, making it often used in osteoarthritis and joint problems. CBD oil is also being used increasingly in horses, to improve performance. CBD Oil for Animals is an excellent tool for maintaining and supporting the health of dogs, cats and horses. The best way to administer CBD oil (domestic) animals is to mix this with the feed. The dosage depends on the type of complaints, but also on the size of the animal. The Optima CBD oil brochure describes the dose for dogs, cats and horses. Global demand for CBD oil has risen sharply. There has been much research into the efficacy of CBD in (mainly) dogs, cats and horses, with only positive results. 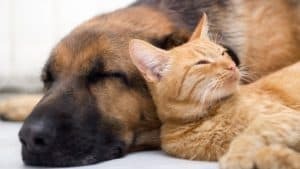 In addition to the relaxing and anti-inflammatory effect, CBD is also used in animals with diseases such as diabetes, rheumatoid arthritis, osteoarthritis, chronic pain and nausea. Also, more and more people believe that CBD can increase performance. Would you like a personal consultation? We have a horse and dog owner, as well as a horse trainer who has gained a lot of experience with dozens of horses and other animals with our CBD oil. Call comfortably at: 0031-186 680 670.